You don't need to wear a smartwatch or fitness band to count your steps every day. Just carry your phone and let an app track your step count. If you’re looking for a free, efficient and feature-rich step counter, then our Health & Fitness App of the Week is definitely worth a try. 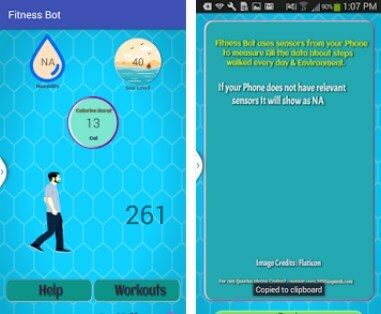 Fitness Bot is an amazing app brought to the Android platform; we’ve been using it for the past week – nonstop! Read the following article and find out everything about it. Fitness Bot is more than a mere step counter. This amazing pedometer counts your steps and burned calories without using your device’s GPS. If you want to save your battery and keep a close eye on your progress, then this app is perfect for you. Developed on the Android platform, this workout tool is free of charge and very easy to use. The Fitness Bot app is obviously designed with walkers in mind, offering a wealth of cool and useful features. First of all, it does not use GPS to track your steps! The app has uses built-in sensors to count your steps and to help in measuring calories burned each day. A great way to save your battery life! Also, the app measures environmental humidity and your height from sea level, so that you can be aware about the weather conditions. Easily tap start or stop, carry your Android device with you and let the app run in the background. It will show you data about your steps and calories you’ve burnt. If you want to have this powerful Health & Fitness app in your device, click the Google Play Store link below and get it for free.